The Design Technology Department at Prenton High School is committed to providing an exciting, creative and challenging curriculum to all students. The design technology department is situated in three specialist rooms on the lower floor, L8 the Food specialism room, L7 which is a recently upgraded open plan product design area with practical workshop including a new laser cutter. The third room is L9, a linked computer suite, where students undertake research and design tasks. The Design Technology Department aims to allow students to combine practical and technological skills with creative thinking enabling them to design and make products. We aim to equip students with the skills to think creatively, be socially, morally and environmentally aware and solve problems as individuals, in pairs and as team members. Students will also be provided with the opportunity to develop their confidence in using a wide range of tools and equipment. As a department we aim to contribute to the whole school policy of providing students with a broad and balanced curriculum which will equip them with skills that they can use in the future and prepare them for a world of rapidly changing technology. All students will spend two 50 minute lessons per week within Design Technology. Half the year is spent in Food Technology and half the year in Product Design. Years 7, 8 and 9 are taught as mixed ability groups. Students design and make a variety of products in Years 7, 8 and 9. They learn about different materials such as paper, card, smart materials, plastics, wood and electronic components. They work with a range of tools, equipment and machinery, including CAD/CAM (Computer Aided Design and Manufacture). A door plaque for a room of their choice. This introduces the students to the workshop, using new equipment and tools safely and confidently as well as introducing them to Computer Aided Design and Manufacture. Developing their CAD/Cam skills further, they design and make an acrylic earphone holder. Finally, they will learn about structures and the principles of sustainable design. During Year 8 students will consolidate and extend the skills acquired in Year 7 to produce a variety of products including a bio-mimicry inspired clock and photograph frame and a simple electronic project. During these projects the students will further develop their skills in Computer Aided Design, using a wider and more complex range of materials. In Year 9 students are given further opportunities to work in a wider variety of materials and to refine their design and practical skills. The first project focuses on the manufacture of a holder for a mobile phone. They will also make a wooden desk top calendar or undertake an electronic project. Sustainable design and a circular economy is also a focus whereby the students design and make an outfit and range of accessories using recycled or up-cycled materials. This leads to an exciting, cross-curricular eco-fashion show with the Performing Arts department. Design Technology offers a range of enrichment activities for all students. Students have access to the department during lunchtime and after school to finish projects and complete home learning. A very successful and popular Cooking Club is organised after school every month using seasonal produce or making products for seasonal celebrations e.g. Christmas Cakes. 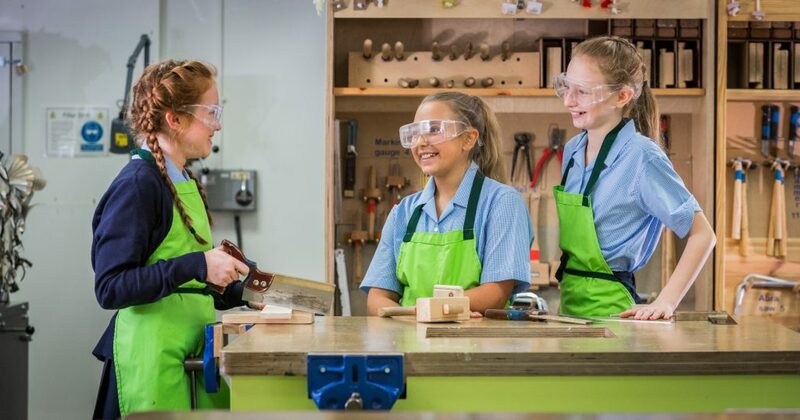 A wide range of Enterprise activities are organised within the DT department – these include a “Trees from Trash” day whereby Year 7 students design and make Christmas trees to sell using recycled materials. A Valentine market place selling a range of products designed and made by Year 8; students and apprentice style challenge for Year 9 students who design and market a new breakfast cereal. In addition there is a departmental “pop up” shop that is used for enterprise competitions. The department also organises annual visits to Slatterys, local colleges, The Big Bang Show and the Clothes Show.